Built 1930 by Leo Kammel. 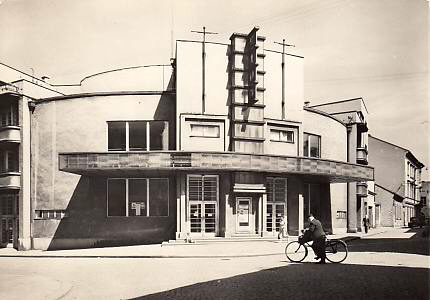 Opened 25 Dec 1930 as "Cinema Cosmos". 1969 major reconstruction; reopened as "Cinema May". 2006 major reconstruction, including a reconstruction of the 1930 exterior. Reverse Text: "Nový Jicín - kino"